Madeline Miller has a way with words. Reading The Song of Achilles was like swaying with the waves, the ocean lapping at you and the peace making you one with the environment. It was soothing, inviting and towards the end, a surge of emotions. I hadn’t felt this connected to a book in the longest time and so, was more than eager to get swept up in Patroclus’ narration. Told from his point of view, the novel builds a timeline of events that have seen Patroclus and Achilles together, wrapped in a cocoon of love and support for one another. While we are introduced to Patroclus as a young boy of 9 years age, floundering under his father’s decision to present him as a suitor for Princess Helen, it is much later that he grows into an individual in his own right. 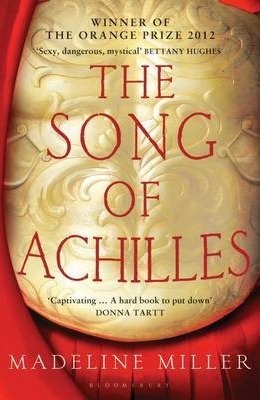 The author delivers the story of Patroclus and Achilles with such beauty, as to absorb us into the book, unable to set it down even for one moment. I was especially convinced of her genius when the scenes pertaining to war and politics, instead of diminishing my interest, furthered my desire to know more of what had transpired. In all its unabashed honesty, Miller depicts the foolishness of humans; the manner in which the pride and prejudice of kings have ushered in their downfall. Bound to the story with ropes of intrigue and awe, I kept wishing that Achilles had had more clarity of thought, allowing him to assess the situation better and take decisions that might have (sort of?) prevented a great deal of mishap. One thing you’re going to have to keep in mind is that this novel mentions a large number of mythological figures, which means atleast a hundred Greek names bouncing off your mind. They weren’t easy for me to remember, particularly the names of the secondary characters. But rest assured, the twenty or so important ones will remain in your memory. It was a mesmerizing thing indeed to read about Patroclus and how he changes from an ordinary, under-confident lad to one who stands up for people, knows his worth in war and is incredibly courageous. Achilles’ character arc, on the other hand, takes a surprising dip. I like the inclusion of Briseis’ character. She plays a pivotal role in Achilles’ life and brings a new dynamic to Patroclus’ identity. The Song of Achilles is abundant with themes of love, politics, greed, slavery, monarchy to name a few. On the whole, it was such a pleasant experience reading about the eternal nature of Patroclus and Achilles’ relationship. I can’t believe that I put off reading it for so long. Now that I have, it wouldn’t be far-fetched to say that this has become one of my all time favourites. Highly recommend it to those who enjoy reading mythological fiction. PICK. IT. UP. NOW. What do you get out of this book? An epic story about two epic characters from Greek mythology, with a dash of romance, politics and friendship.